– Dunc and J.D. went with the twelve year old scouts last weekend to hike and sleep in the Superstition Mountains. 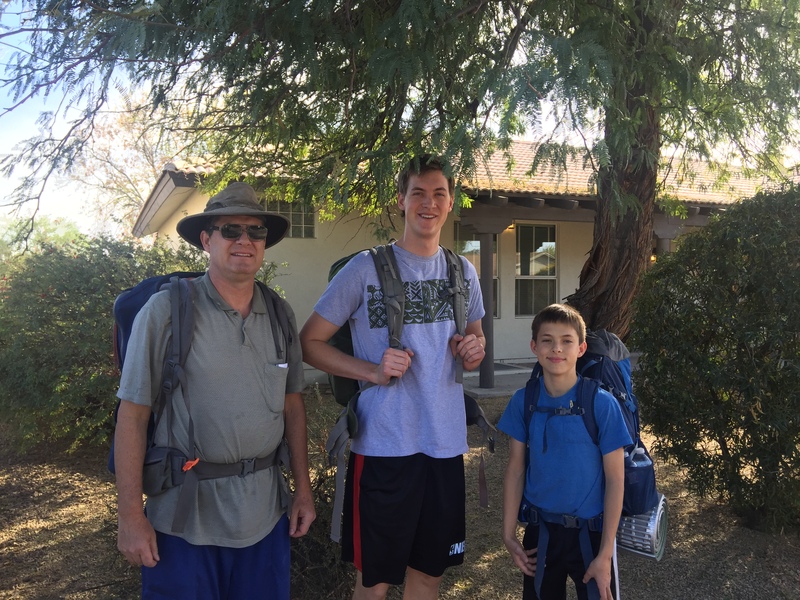 Because we live close to the church where the scouts were meeting before caravanning to the mountains, my three hikers walked to the church with their gear on their backs. 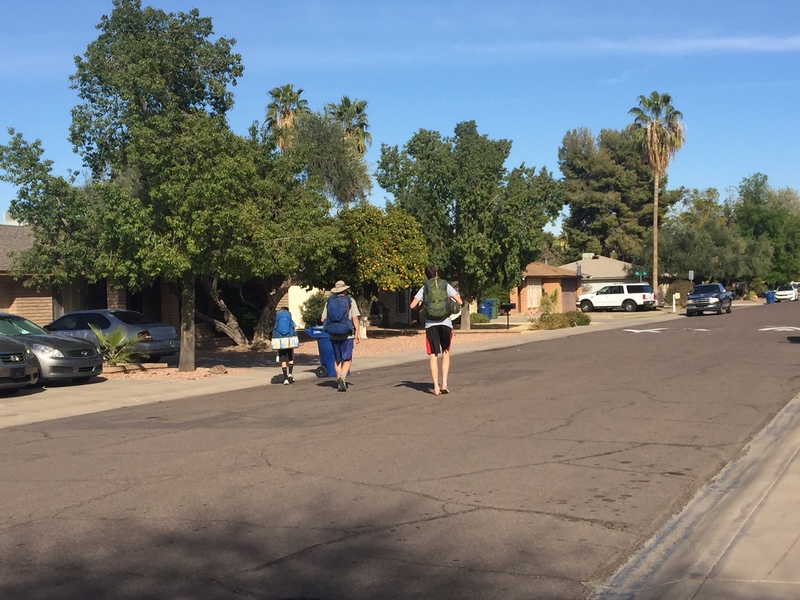 It looked so funny to see these guys walking down the middle of a regular neighborhood with big packs on their backs! Duncan is getting really excited for his hiking season. If you didn’t already know he has been working on hiking from Mexico to Canada (the Pacific Crest Trail) in chunks every summer. He has hiked 1,008 miles and has 1,660 to go. 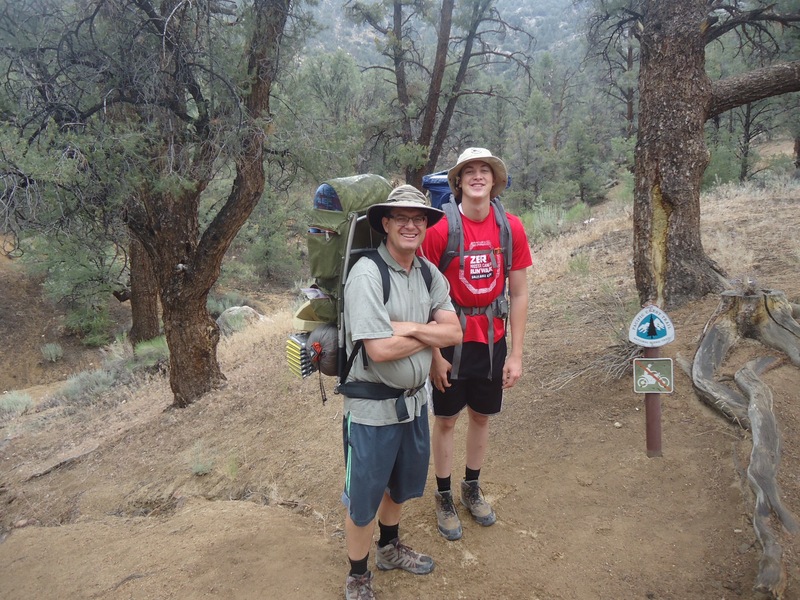 He hopes to hike more than ever this summer – 270 miles. Two years ago Curt, Adam, J.D. and I joined him for 56 miles. Here is a photo from the top of Forester Pass,the highest point on the Pacific Crest Trail and on the John Muir Trail, in 2016. We camped above tree line among mountain top lakes the night before this. You just can’t get an accurate feeling of the majesty of these mountains from the photos. We had been climbing for 3 days to get there and the feeling of being on top of it all is unforgettable. It is funny that we look almost like we are in the desert here. We are actually at 13,300 plus feet in elevation! Look behind us. That is one of the very high mountain lakes that we passed as we ascended. These lakes have iceberg type chunks of bluish ice floating in them. They are frozen over at their shore lines. They are a gorgeous blue. It is interesting that there is so little vegetation and almost zero wild life that high. What an accomplishment – especially for me, the slowest but still determined. 🙂 There was a couple miles of snow and ice hiking on both sides of the pass. This kind of hiking I had never done before. I had to be careful not to look around too much because I almost felt dizzy at times. Look at the huge mountains that are BELOW us here. I was limping on both legs by the time I got off the trail (John Muir Trail of the High Sierras). Curt and I hope to join him for a bit this summer too. J.D. has caught the hiking bug and is committed to hiking the entire Appalachian Trail this summer from Georgia to Main, which is 2,200 miles in 3 1/2 months! Here is a letter by Duncan to his family, when he began the adventure. I’ve had a few questions about my venture this summer, so here is more information (just so you know, this is a fairly long email). This year will be the 1st of 5 or 6 hiking the 2,668 mile-long PCT from the Mexican to the Canadian border. Some folks take 4-6 months & do it all at once, but I’m spreading it out over several years, and those years may or may not all be consecutive. I’m extremely fortunate (“blessed” is the right word) to have a wife & family that is strongly supporting me in this activity. From the beginning, Kristin has been behind me. I’m also fortunate that I have a job allowing me to take 5-6 weeks off at a time (one of the benefits of enduring all of those years of grad school). The PCT, or Pacific Crest Trail, is considered one of the world’s best–if not the best–of the long-distance hiking trails. It is also open to equestrians (but not mountain bikes or motorized equipment). The trail’s reputation is one of good signage and fairly easy to follow, and is maintained by an army of volunteers with strong cooperation from the Forest Service (the primary agency), National Park Service, Bureau of Land Management, and other land management agencies–mainly federal, but also some state ones. Nearly all of the trails is on public land (the rest is on private land where the owners have given easements and right-of-ways). The Pacific Crest Trail Association (http://pcta.org) keeps the trail and its volunteers quite strongly organized. Despite the word “Pacific” being in the trail’s name, the ocean is never in view. Rather, it follows the high elevation mountainous “crest” of the Southern Californian mountains, the Sierra Nevada, and the Cascades. Because of that, it is also a brutally difficult trail in terms of elevation gain and loss. Comparisons are invariably made between the PCT and America’s other famous long-distance hiking trail, the Appalachian Trail (or AT). Those who have hiked both say the PCT is far better than the AT in terms of scenery, variety, and tranquility, but is also a much more rugged and difficult hike. It is precisely that scenery and variety–and the ruggedness–that attracts me to the trail. There are a number of towns near (but not right on) the trail for resupply. Highway crossings occur with some frequency in the Southern California, Northern California, and Oregon portions, but hardly at all in the High Sierra, nor throughout most of Washington & the North Cascades. Crossings of freeways & other busy highways are usually by underpass or less commonly by overpass. This year the freeways I will cross are Interstate 8, Interstate 10 (where the wind turbines are at), Interstate 15, and California Freeway 14. Detailed guides (of which I own a couple now) point out the resupply locations, good camping spots, and water supply (most of which I will need to treat with my water filter and a bit of bleach). My PCT permit allows me to camp at any reasonable location near the trail–but at least 100′ from the trail itself. “Hiker-Town” (my end point this year) is located about 30 miles north of (as the crow flies–many, many more in road miles, of course) Six Flags Magic Mountain amusement park, but on the other side of the San Gabriel mountains. Hiker-town is a small business that has some food for hikers, but more importantly showers! (along with laundry machines, and a few bunks in a hostel-type of environment (and outdoor grass for camping if the bunks are all taken). A separate, but similarly PCT-located, business (called “Hiker Heaven”) exists in Agua Dulce off of California Freeway 14 near the famous Vazquez Rocks. Even though the L.A. basin will never be far away from much of this year’s journey, the metropolitan area is never in view (except for when I summit Mt. Baden-Powell) as the trail stays to the north side of the San Gabriels. It is estimated that somewhere between 30-60 people per day will cross any given point on the trail during the main hiking season. However, since most hikers are northbound, they actually don’t come across each other very often. About 500 or so people “through-hike” the trail every year (completing it from start to finish). I’m considered a “section hiker” but I’ll be hiking 4 complete and a partial 5th section this year. My supply acquisition is nearly complete. My new REI backpack feels comfortable even with 40+ pounds in it (I’ve taken it with me on a couple of 20-milers now). My training continues apace, and I feel good about my preparation. However, I realize that hiking in general and long-distance hiking specifically, carries a certain amount of risk. The things that can go wrong are numerous, and I realize that–but I also know that come May 19th I’ll be as prepared as I possibly can. The inspiration for hiking such a long trail is two-fold. 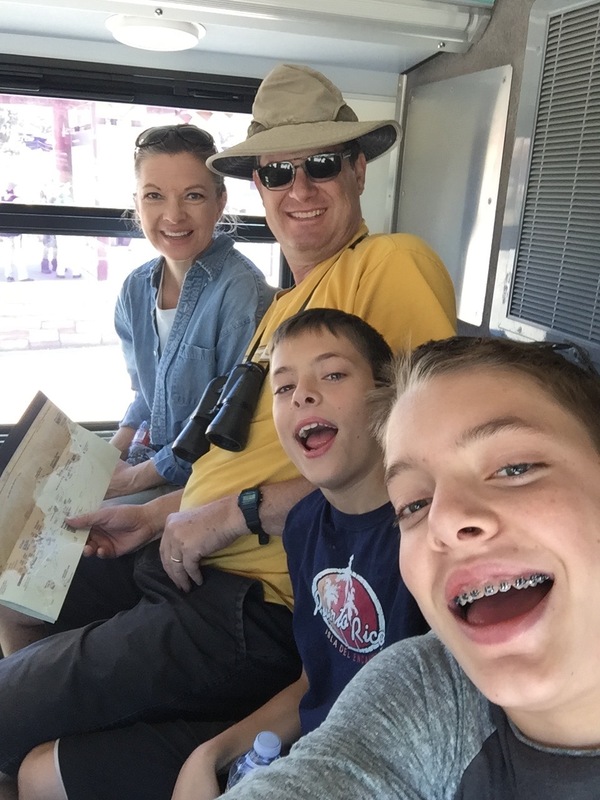 First is my love of the outdoors and hiking (anybody who knows me knows that about me) as well as a love of backpacking, which began at age 11 with the family backpacking trips in the Pagosa area–those remain among my favorite memories growing up. 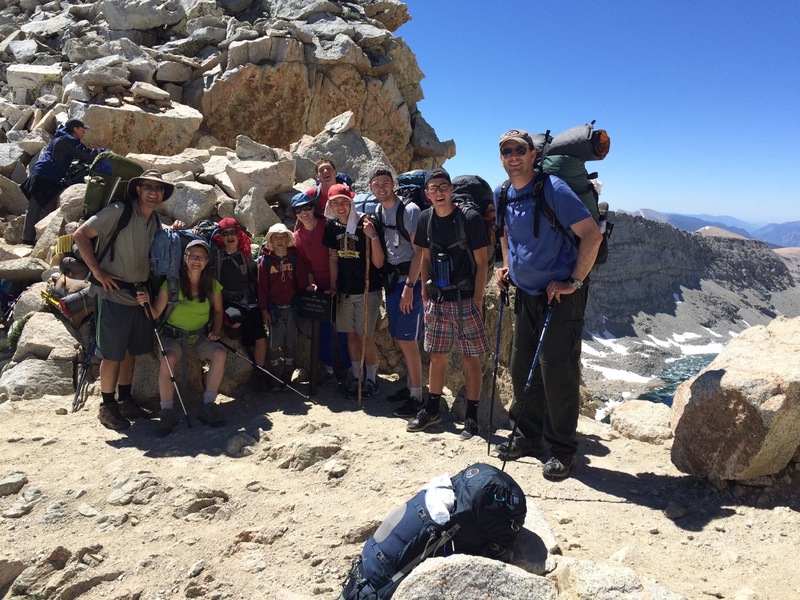 Scouting activities–Philmont primarily–reinforced that love of backpacking. Secondly, hiking the PCT became my “bucket list.” In fact, it is the only thing on my bucket list. The beginnings of wanting to hike the PCT started one morning in Pagosa when I was 23 years old. It was a bright, sunny morning and breakfast had just concluded and the tables were all clean. I was sitting at the picnic table near the white (Shaeffer) trailer and looking at a Rand McNally road atlas, something I often did. I noticed on the map of Southern California a hiking trail, and I followed the trail with my finger on the map all the way through California, Oregon, and Washington. Rand McNally only shows two hiking trails on their U.S. road atlas, the PCT and the AT. That was the beginnings of wanting to hike the PCT. I should have hiked the PCT right then (in the days before I met Kristin), but alas, I never did. The desire to hike it has never gone away, and in recent years, has even increased. Now with two kids on missions and the other 3 boys getting older, the time is right, family-wise, for me, and at long last I am beginning the trail.